She's Not Herself: A Psychotherapist's Journey Into and Beyond Her Mother's Mental Illness is a journey to make sense of the effects of multi-generational traumas. Linda Appleman Shapiro is ultimately able to forgive (without forgetting) those who left her to fend for herself--and to provide readers with the wisdom of a seasoned psychotherapist who has examined human vulnerability in its many disguises and has moved through it all with dignity and hope. The result is a memoir of love, loss, loyalty, and healing. On the surface, her childhood seemed normal--even idyllic. Linda Appleman Shapiro grew up in the iconic immigrant community of Brighton Beach, Brooklyn, with her parents and a gifted older brother. But she spent her days at home alone with a mother who suffered major bouts of depression. At such times, young Linda Appleman Shapiro was told, "Your mother...she's not herself today." Those words did little to help Linda understand what she was witnessing. Instead, she experienced the anxiety and hyper-vigilance that often take root when secrecy and shame surround a family member who is ill.
She's Not Herself: A Psychotherapist's Journey Into and Beyond Her Mother's Mental Illness is available as an e-book and paperback at Amazon, Barnes & Noble, Dream of Things.com, IndieBound, and several other on-line book sites listed on Goodreads. 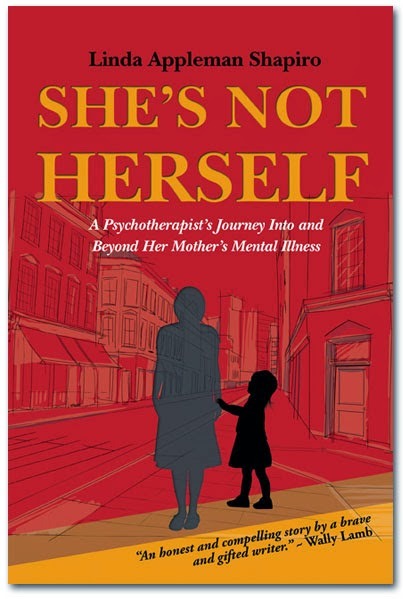 To win a copy of She’s Not Herself: A Psychotherapist’s Journey Into and Beyond Her Mother’s Mental Illness please enter using the Rafflecopter form at the bottom of this post. The giveaway contest closes this Friday, November 14th at 12:00 AM EST. We will announce the winner the same day in the Rafflecopter widget. Good luck! Behavioral psychotherapist / Addictions Counselor / Oral Historian / Mental Health Advocate and author, Linda Appleman Shapiro earned her B.A. in literature from Bennington College, a Master's degree in Human Development/Counseling from the Bank Street College of Education, and a Master Certification in Neuro-Linguistic Programming from the New York Institute of N.L.P. She has further certifications in Ericksonian Hypnosis and Substance Abuse/Addictions Counseling. In private practice for more than thirty years, Shapiro also served as a senior staff member at an out-patient facility for addicts and their families. 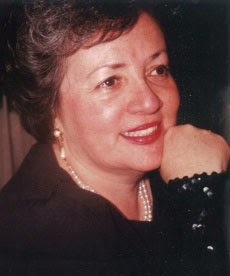 As an oral historian, she has documented the lives of many of New York's elderly. Her first memoir, Four Rooms, Upstairs, was self-published in 2007 and named Finalist in the Indie Next Generation Book Awards in 2008. Her blog of three years, “A Psychotherapist's Journey,” named Shapiro Top Blogger in the field of mental health by WELLsphere. Excerpts from FOUR ROOMS, UPSTAIRS appear and are credited in SHE'S NOT HERSELF, which has been released as a new book, with a new title and cover, thoroughly restructured and edited, and with an endorsement by famed author Wally Lamb on the front cover. Married to actor and audiobook narrator George Guidall, Linda Appleman Shapiro and her husband live in Westchester County, New York. They have two adult daughters and two grandchildren. WOW: Linda, Thank you for choosing WOW to help promote She’s Not Herself. It has truly been a pleasure working with you. I have to ask, what prompted you to publish such a personal story? Linda: The problem of mental illness hits close to home for many these days. When I was growing up in the 1940s and 50s with a mother who suffered from bouts of major depressive illness, the media – and TV shows, especially ones such as Dr. Phil and Oprah – did not exist. Families such as mine were left to suffer in silence and with shame, not knowing where to turn for answers to their anguish or options for their loved ones or themselves. I realized that I not only had a story to tell but could tell it with the perspective of someone who found ways to move beyond trauma. I was determined to share my story. However, I was equally determined not to share it as a how-to manual, though I’ve been a psychotherapist for thirty years. Rather, my goal was to personalize it – to bring the reader into our home, able to see our rooms, hear our conversations, witness my mother’s many declines and how it affected each of us. In the end, my hope is that readers who are still suffering will find some degree of hope and believe in the possibility of moving forward as they gain knowledge and work toward forgiving without forgetting. And for those whose families have never been afflicted, I hope that new-found compassion will help them to advocate for mental health and support much needed funding to help the 1 in 4 people who suffer from one mental illness or another in today’s all-too chaotic world. Access to better care and facilities that have trained and committed psychiatrists, psychotherapists, social workers and nurses must be a priority. The most recent statistics on suicides in America have increased considerably and that speaks of a lack of moral responsibility toward all who suffer. Mental illness as well as cancer and other seemingly epidemic illness of the 21st century must all be attended to, if we are to have a healthier and saner world. WOW: Count me in for a healthier and saner world. Linda, you mentioned that you were determined not to share your story in the form of a how-to manual and chose memoir instead. Was there any struggle in this decision? Linda: Interestingly enough, I did not set out to write a memoir. In the 1990s when Self-Help books were the rage and I was recommending them to my patients at a clinic for recovering addicts and their families, I realized that few if any were written for Adult Children of the Mentally Ill. All were addressing the effects of growing up with a parent or sibling who suffered from one addiction or another. The template was there and I started to write my self-help book. But only three pages into it, I began to sob and realized that would be the easy way out for me. Others could write such a book and write it well. But I had a story to tell and it was my story. Once I began, the writing seemed to write itself. I had the outline for the entire book within weeks. What I didn’t have, though, were the tools to best help me show my story without telling it, without pontificating and assuming that readers knew things about where we lived, how we lived, dressed and talked to one another. In short, I really had to teach myself how to write – creating scenes and dialogue, for starters. As mine was a labor of love and tenacity, I worked on my memoir for several years (while working full time and living life within our family, with our daughters and later our grandchildren). I wrote and re-wrote as I peeled away the layers of the onion that was life. As one memory emerged, others came forth . . . and there were many times when a memory was so horrific that I questioned if what I was remembering actually happened. But it did all happen . . . and as one witness to human vulnerability and human strength, my memoir is already rewarding me. Readers are contacting me personally and through social media thanking me for sharing my family’s story. This week it was named #1 memoir among female memoirists. I know how much it would have meant to my mother to know that I took secrets out of the closet, allowing others to put their own shame aside knowing that they are not alone, and perhaps even gaining insight to their own dark stories. Interestingly enough, my mother always told me that if her life story could help even one person, she would tell it if she were a writer. I have to believe that she is proud to know that together we have told her story and mine and that we are helping people in the telling. WOW: Your mother must have been a strong woman to be so selfless about sharing her story. I’m sure readers will agree, you’ve shared it in a loving way. Now you are a well read woman, so tell us who your favorite author is and why. Linda: I wouldn’t be honest if I said I had one favorite author or one favorite book. However, since my teen-age years and later when I wrote my undergraduate thesis for graduation from Bennington College on "The Concepts of Love and Marriage in Tolstoy’s Fiction," I’ve been fascinated with the writings of Tolstoy, Dostoevsky and Proust. Authors who are able to create multi-leveled worlds within worlds and characters that have both depth and authenticity are those who fascinate me the most. Among 21st century writers, I find that to be evident in the books authored by Wally Lamb. My favorite of all his writings is probably, I Know This Much Is True. Perhaps that’s also why I am so very honored that he endorsed my memoir on the front cover. What a gift! WOW: Wally Lamb is also one of my favorites. If you have a chance to speak with him personally, tell him I have just one complaint: I want him to write more books! If your book were a movie, what song would be included and why? Linda: The song would be “HELP IS ON THE WAY” sung by the incredible cabaret singer Nancy La Mott. She lost her battle with cancer at too young an age but still left us with the magic of her recordings. I chose this song because if my book leaves readers with any message I hope that message is that Help can be on its way! WOW: You have such a nice way of putting others first. So, what’s next for you: is there another book in your future? Linda: In spite of the fact that I’ve been told it’s very hard for authors who are not well known to get a book of essays published, that is, in fact, my next project. Since I grew up not knowing how to be care-free and spontaneous but was, instead, always on guard and hypervigilant, never knowing when the “black clouds,” (as Mother referred to the times when she was overcome by her demons) would descend . . . I was overwhelmed with joy when I spent an evening with my granddaughter (then 3½) and she asked me – when playing with a soft, cuddly stuffed unicorn – if I knew that unicorns ate strawberry ice cream. She couldn’t have been more serious on the one hand and more playful on the other. That ability left me awe-struck. So much so that I wrote a blog about it that week in A Psychotherapist’s Journey, a blog that I posted for three years and hope to revive in 2015. Hearing her laughter and knowing how secure she felt about going to sleep at night were not luxuries afforded to me, and for those of you who may have lived through family traumas or are living through them now, such luxuries are, no doubt, absent from your lives as well. Yet, while anything can happen to any of us at any time, we can’t afford to allow the news of the week – the multitude of disasters around the globe – to deny ourselves the sheer pleasure of appreciating a child’s delightfully trusting and magnificently magical imagination. Even though such times may be too few and too fleeting, they are always precious. That is why when we have the privilege of being with children reflecting the safety of the world as they know it, reveling in their playfulness enriches our lives. Learning from their ability to feel free enough to think creatively, encourages us to be open to all sorts of new possibilities. It serves us well to know that if we allow our innocent children to captivate our attention and in so doing inspire us, offering the opportunity to share in their gaiety, knowing that – even while they are aware that they are weaving a yarn, making up a story such as one where unicorns really do eat strawberry ice cream – so much more is possible. I have always been fascinated by the power of myths within families, cultures, and religions – all of which influence our choices, affect our beliefs, and color our biases. Although many people associate the word “myth” with Greek Mythology, Webster defines a broader usage of myth to include “any invented story, concept, or idea.” It’s this broader sense of “invented stories” and how they affect us that I address in my essays. Whether we believe or don’t believe the constructs that have been passed down to us, we continue to tell ourselves stories to create other myths to heal old scars or enhance current joys. Only when we work to change negative behaviors do we create new realities. Such new realities help us identify the myths we’ve chosen to sustain us and allow us to discard those that have harmed us. Questioning and exploring the role myths play in our lives, the essays address a wide range of subjects, including the whimsical, Unicorns Eat Strawberry Ice Cream! where I marvel at a child’s ability to enjoy the luxury of imaginative play because she perceives her world to be safe and loving. More often, however, I address the serious implications of myths as they impact our 21st century living -- including our need to understand relationships; the effects of failing economies; the changing priorities and new definitions of what constitutes a “family;” the attitudes toward mental health and the health care system itself; bullying in various arenas, and our changing attitudes towards toward age and aging. Throughout this book, my mission is to disempower outdated myths that impede progress. I’ve been told that this book of essays is the first book written by a psychotherapist addressing how the myths we absorb over time affect our present-day lives. If we become aware of them, we might then replace them with new stories – myths, if you will -- that reflect our current realities, promote healthy growth and help to fully realize our potential. In order to move forward, we need the freedom to allow our imaginations to be more expansive, our attitudes towards people and cultures to become more inclusive. It’s a path toward the development of a saner, more civilized world. WOW: Sounds like more excitement is yet to come! Join Linda Appleman Shapiro as she speaks openly with Madeline Sharples about mental illness coming out of the closet and constantly being in the news (as opposed to when she was growing up in the 1940s and 50s.) Most importantly, she personalizes what it is like to live with a family member suffering from a mental illness by sharing her experience growing up with a mother who suffered from major depressive disorder. And though she points out that today's readers are much more educated and able to seek help for themselves and loved ones, her story will still resonate with them. Join memoirist Jerry Waxler as he reviews Linda Appleman Shapiro's memoir She's Not Herself: A psychotherapist's journey into and beyond her mother's mental illness. Hear from Linda Appleman Shapiro as she talks to fellow author Lauren Scharhag about how to determine you're meant to write memoir instead of fiction. Find out more about Linda and her touching memoir She's Not Herself: A psychotherapist's journey into and beyond her mother's mental illness. Linda Appleman Shapiro is the guest author at National Association of Memoir Writers sharing with readers "How to write without my psychotherapist's voice. That is, how to tell my story by showing my family in action - - creating dialogue, describing details regarding how we looked, what our neighborhood and particular house was like...in short, how not to analyze but how to show without telling the particulars of our family's struggles, challenges, and successes." Today is the day to learn more about She's Not Herself, the highly acclaimed memoir by Linda Appleman Shapiro AND it's your chance to enter a giveaway to win your very own copy. In addition to this wonderful opportunity, Shapiro is guest blogging at CMash Reads on the topic of "The importance of not stereotyping anyone who suffers from mental illness"
Join Lisa Haselton as she interviews Linda APpleman Shapiro about She's Not Herself: A Psychotherapist's journey into and beyond her mother's mental illness. Linda has also offered an ebook copy of her book for a giveaway; so don't miss this great blog stop! Author Linda Appleman Shapiro shares her thoughts with readers of Renee's Pages. Today's topic is "How to know what behaviors to recognize as being worrisome and why wishing them away will be (conuter-producting) counter productive. Taking action is always necessary to help people avoidfalling through the cracks, not receiving help and opting to commit suicide, not knowing how to help themselves get rid of their demons." Author Chynna Laird hosts Linda Appleman Shapiro and her memoir She's Not Herself: A psychotherapist's journey into and beyond her mother's mental illness and Shapiro talks about "Funding for Mental Health" and how despite the fact that we still do not have enough funding for mental health, we certainly are far better off when we know where to seek help and how to advocate for ourselves or a loved one who needs professional help. Enter to win a copy of She’s Not Herself: A Psychotherapist's Journey Into and Beyond Her Mother's Mental Illness by Linda Appleman Shapiro! Just fill out the Rafflecopter form below. We will announce the winner in the Rafflecopter widget this Friday, November 14th! Thanks for being brave enough to share your story. What an interesting person Ms Shapiro appears to be. I loved the bio and the interview. But, I was most attracted to her new book and the story about her mother. I too grew up with a mentally ill mother. I am 84 years old and to this day I can still see her sitting in a hospital bed fretting that her teeth were all crumbling and falling out. I was 12 years old. My mother is mentally ill so I know what it is like to live it day in and day out. Please do read my memoir. I think that having grown up with a mother who was mentally ill will allow you to gain a greater appreciation for that 12 year old girl who was you witnessing all that you did as well as for your mother. If you do get to read "SHE'S NOT HERSELF," please do contact me and give me your feed-back. I always welcome a reader's response. Thanks. Thanks for thinking that I was brave, but the larger truth is that once I decided to share my story, it didn't feel as though I was being brave. Rather, I felt compelled to let others know that they are not alone if they experienced the ripple effects of a family member's illness . . .and for those who are currently experiencing living with a parent, child or sibling who is chronically ill (emotionally or physically) . . . to let them know, as well, that their needs should be attended to, along with the best treatment for all patients. Thanks Margo. As an advocate for mental health -- given the almost epidemic #'s of young people committing suicide, alone, is enough reason for us all to get on the band wagon for better funding for research and treatment for all patients and their family members... to say nothing about educatinmg the public at large. I hope you do choose to read my book and give me feed-back, given your recognition of how important this topic is for all of us. This hits home for me-thank you!